You are here: Home / CFL Fan Fight Cancer / Tackling cancer: Dante Marsh raffle winner gets her prize! Tackling cancer: Dante Marsh raffle winner gets her prize! Today I had the pleasure of helping award the Dante Marsh canvas print that Dante provided for us to raffle off for CFL Fans Fight Cancer. The lucky winner was Heather Swift of Abbotsford, BC. who purchased her ticket a tailgate party earlier this season. 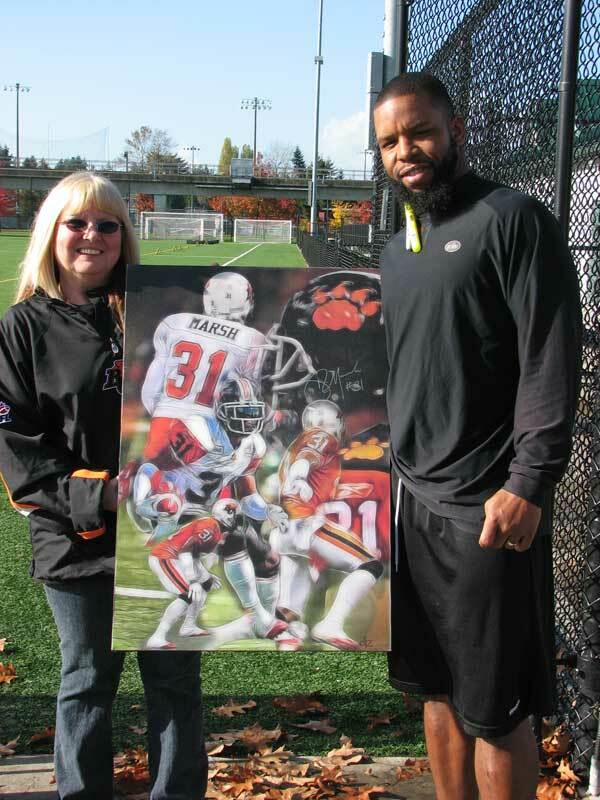 Heather ventured out to the BC Lions practice facility today to receive her prize from Dante himself. After the cost of the print, we were able to raise $300.00 for CFLFFC. Each year a group of CFL Fans across Canada attempt to raise money for various Cancer charities on our local communities. This past off-season, Lions DB Korey Banks lost his young son to cancer and he’s in the process of establishing the Hope24 Foundation in his honour and to help those fighting childhood cancer. Today, the BC chapter of CFLFFC, thanks to the help of CFL fans like you, were pleased to donate the $300.00 raised through this raffle to Banks’ new foundation in memory of his son. Thanks to Dante Marsh and to CFL fans for their support and congratulations to Heather!